ANNAPOLIS, MD — Today, nearly 100 Maryland community leaders and activists rallied at the Maryland State House in support of the top environmental bill of the 2019 General Assembly Session: the “Clean Energy Jobs Act.” With their inflatable green surfboards, activists showcased the growing momentum behind the bill. They called on Governor Hogan to put away his famous “purple surfboard” and instead ride the growing “green climate wave” in the state by supporting this key bill. 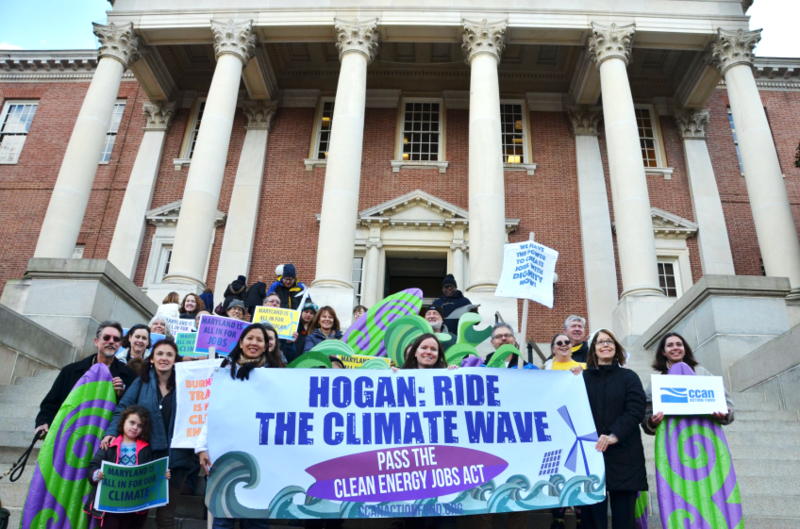 The advocates — representing business, faith, labor and environmental groups — also released a new statewide poll showing overwhelming support urging Hogan to support the Clean Energy Jobs Act. The poll, conducted by well-known pollster Patrick Gonzales, found that solid 64% majority of Maryland voters think that Governor Larry Hogan should support the Maryland Clean Energy Jobs Act, with consistent support spread across all regions. See poll results in full here. The Clean Energy Jobs Act would increase the state’s renewable electricity standard to 50% by 2030 and require legislators to develop a plan to reach 100% clean power by 2040. Support for climate action in Maryland has new momentum since the 2018 midterm elections, when hundreds of candidates for the state legislature made supporting CEJA a campaign issue. After the elections, a de facto “supermajority” of legislators in both the Maryland Senate and House are on record supporting the proposed bill. This happened amid new alarming national and international scientific studies on climate change and scandalous climate policy retreats by the Trump Administration. A de facto “supermajority” of elected legislators in both the House and Senate are on record supporting CEJA ahead of the 2019 General Assembly session. A veto-proof majority of 30 elected senators has explicitly signaled its support for the Maryland Clean Energy Jobs Act. Similarly, for the House of Delegates, 84 elected legislators support the Clean Energy Jobs Act. This does not include the Speaker of the House or two other leadership positions who would almost certainly join the 84 — making a veto-proof 87 — if the bill moves to the House floor. Organizations supporting the Clean Energy Jobs Initiative now look forward to taking these supermajorities of support in both chambers and working with the key committees, committee chairs, and Senate and House leadership in translating this supermajority support into a strong clean energy bill that keeps Maryland on the forefront of clean energy and climate policy. The bill would remove all subsidies for trash incineration under the state’s RPS policy. This will end the practice of Marylanders investing their tax dollars in sources that harm their communities and block investments in clean, renewable energy sources like wind and solar. “Climate change disproportionately affects communities of color here in Maryland, with nearly two in five Latinos living within 30 miles of a coal-fired power plant. 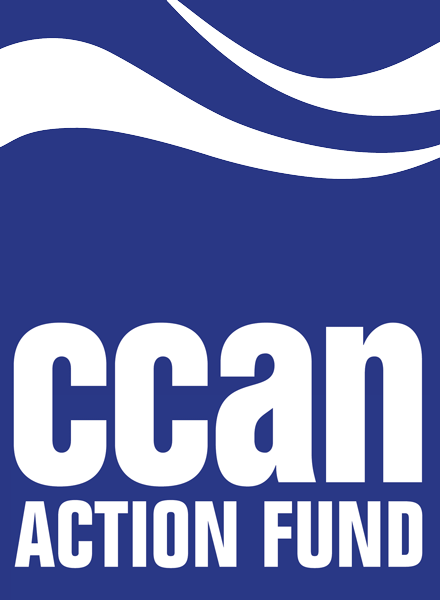 Latino communities understand that our future is at stake and an overwhelming majority support climate mitigation policies, like the Clean Energy Jobs Act,” said Ramon Palencia-Calvo, Director of Chispa Maryland of Maryland League of Conservation Voters. In 2016, the Maryland General Assembly voted to increase the statewide electricity standard to 25 percent by 2020, but Governor Hogan vetoed it. The General Assembly voted to override Hogan’s veto in 2017.